Setting client boundaries can be a difficult topic to address during therapy sessions with a client and can cause a lot of stress for therapists as they go through their sessions. Detecting themes and undertones of conversations or even remarks made by their clients is a therapist’s job and can help navigate discussions towards effective results. The last thing you want, as a therapist, is something taken in the wrong manner or a remark pushed into a direction that puts pressure on a client in any way. Maintaining a professional relationship with your client is very important, both for the nature of the client’s condition and progress a client will make. The best client-therapist relationships start when this is addressed from the first session and onwards and retain this respect for each other’s privacy throughout the treatment. Clients will feel comfortable and all parties feel they can help towards the outcomes of the treatment without bottlenecking each other by overstepping their agreements. As you can imagine there are countless cases of therapists overstepping the mark, and historically for their practice and reputation, this has not been good. But what exactly is defined at overstepping the mark? And how can a therapist actively avoid situations that could spiral into damaging consequences for all? 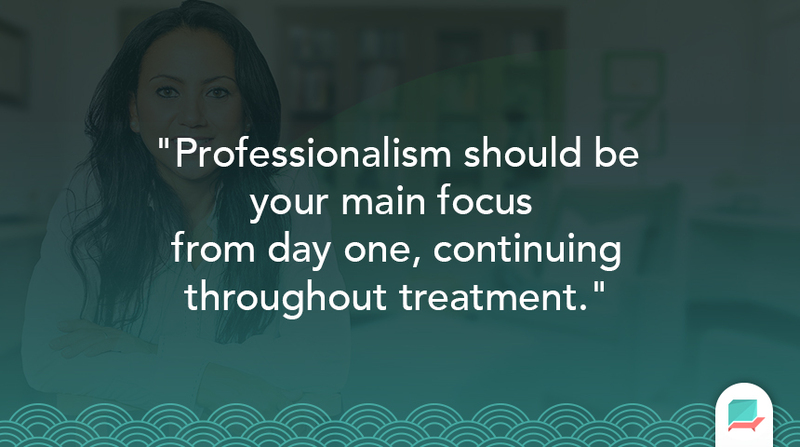 Professionalism should be your main focus from day one, continuing throughout treatment. The first time you meet your client can have a lasting impact and ongoing rapport helps to build your reputation. The topic of confidentiality can be addressed as something highly important, both ways, allowing you to discuss how each party will keep things strictly professional. First things first, your initial session should help address the topic of interactions and the concept of professionalism without making things awkward. In your initial overview of the sessions you will want to outline the session outcomes and best practice to help settle the client into a routine during sessions. The first session is a good opportunity to showcase how the one-to-one sessions will work and the standards expected of both parties. Outlining the treatment plan is an important element of the first session: addressing how the therapy will work and how each session should flow. This helps for clients to see an end goal. This will also give you an opportunity to explain any out of session activities. In this first session, the opportunity to explain the role of homework or activities will help the client to fully understand why it’s important and how it works. After sessions, there are tools that can provide you with clear, formalised communication outside of your time slots, in order to optimise client feedback. 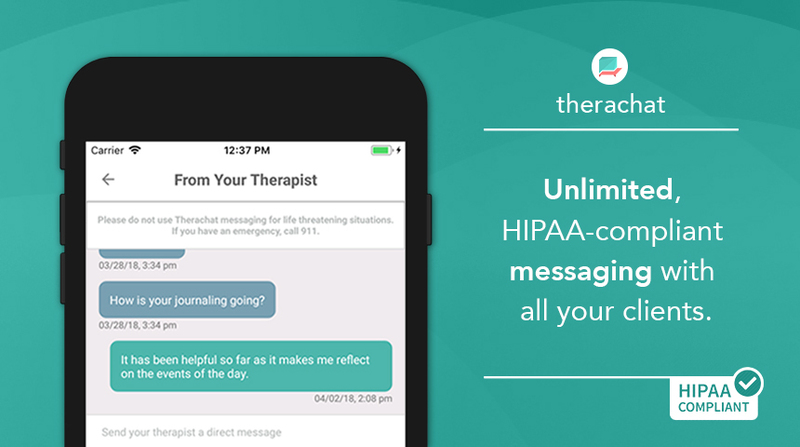 Apps like Therachat are designed to help therapists with the best messaging technologies to finetune their communication and engagement with clients between sessions. After each session, be clear on how you’d like this to run and how you see this working in everyday practice. Use wording along the lines of this to help navigate them towards one sole communication funnel. This is a good, positive way to end the session and helps your client to understand where to go when they need help. Secure messaging need to be in place, making sure your messages are all HIPAA-compliant will help to keep your communication all above board and help to document interactions. 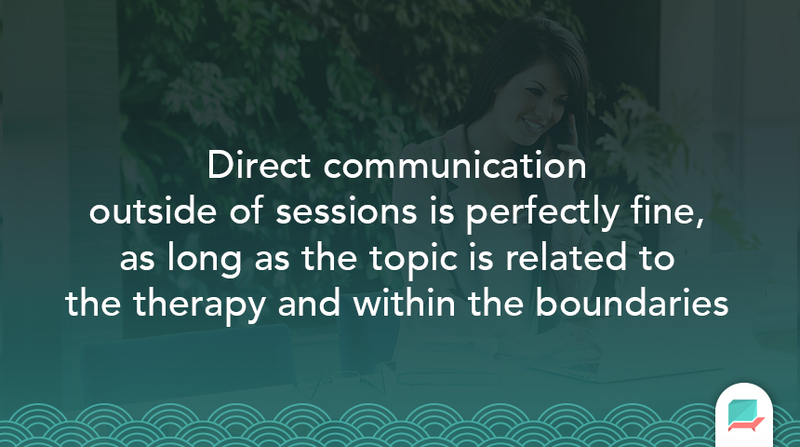 Direct communication outside of sessions is perfectly fine, as long as the topic is related to the therapy and within the boundaries that were set in the beginning. Keeping a conversion on track without it diverging is an important skill set for therapists to have as part of their messaging arsenal. Avoiding any unnecessary explanations or inappropriate discussions will help to reduce the chances of this occurring. With the world of social media, direct communication isn’t solely the place that people can reach you. As a therapist, you aren’t a social hermit, you can have a life outside of your sessions and work, like everyone else. So keeping your social media private and secure is important, your family and your personal information is confidential and should be made aware of opening remarks. With anything, there are warning signs. You might be able to detect these, however making yourself aware too if your client is getting too close during sessions will be important to reinforce the client-therapist relationship. Drawing boundaries will help you determine a good balance of kindness and support between both parties. This can naturally be reversed for clients, allowing them to see whether a therapist is becoming questionable in their practice. There’s an article here to help you pick out the questionable activities of therapists and counsellors. The topic of setting client boundaries can really help to improve your practice and improve the quality of the client-therapist alliance. The best partnerships between a client and therapist are professional and aim towards the goal of supporting the client in their mission to conquer their condition. Involvement outside of sessions is a larger topic in itself and we’ll aim to cover this in a future article, stay tuned! Subscribe for more articles on therapy and addressing issues common to this! With Therachat you can text and chat message unlimited with all your clients. A robust notification system will let you and your clients know when you have a new message And you can easily export all messages into your EHR. 7-Day Free Trial – Learn More!